Let us summarize for this point now. 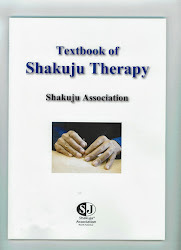 The Tai-ji concept is not merely an conceptual thing, but also is strongly related with our treatment, Shakuju therapy. Firstly, let us look at the fundamental yang, yang of the Tai-ji. This refers to the whole body. And what sustain this body are the gravity and the life. We express this life as "Jing-qi". The gravitational force and Jing-qi are both invisible power, aren't they? The sick state is the condition that the Jing-qi is diminishing. And let us bring up another concept to summarize the relative world with the word of "reference points". Of course, there are various disease names and symptoms concretely, but we are trying to sum up all these things to the words of reference points. This is what we are doing. Yang of the Tai-ji includes both concepts of yin and yang, and we are trying to express them as reference points as a whole. It is easy to understand so far, isn't it? The problem arises from here. What influences on the state of the fundamental yang is the fundamental yin, Jing-qi. When Jing-qi is weakened, changes occur on reference points. Treatment is the attempt to modify such a condition of pathological deficiency of Jing qi. Here, what makes it possible to tonify this deficiency of Jing qi is the imagination of a therapist, in other words, "consciousness". Without this action of consciousness, neither the deficiency of Jing qi is modified nor reference points change. Consciousness of a therapist, as well as consciousness of a patient is related, has a role to tonify the deficiency of Jing qi. Treatment cannot consist of merely with a treatment act. It is not until consciousness of a therapist works that treatment is completed. The interesting is that the most of therapists are not aware of directing their consciousness, but they direct their consciousness unconsciously to influence on the deficiency of Jing qi. So, the fact that any treatment method has each treatment effect is understood as consciousness is used in any treatment method. It doesn't matter what kind of treatment method. I'm not saying that only Shakuju therapy can do it. It is quite likely that as you practice Shakuju therapy, you can apply this to other treatment methods as well. That would be your relationship with your patients, so you can do it freely. What Shakuju therapy is targeting on is to comprehend everything with the idea of Shakuju therapy. In any methodology, as far as a human being performs, consciousness is working there. Then, the consciousness must have some influence on Jing qi. Some practitioner would not express it as Jing qi, but any words can be used because it is about the invisible world. Consciousness works on the deficiency of Jing qi, then it influences on changes of reference points. Generally, you won't use the words of reference points, but you'd say symptoms or diseases. We use the words of reference points because this fits to our treatment policy more, so we prefer to apply this concept. All symptoms stemming from the deficiency of Jing qi are summarized as reference points. So if you have any sick symptoms, there must be the deficiency of Jing qi underneath.